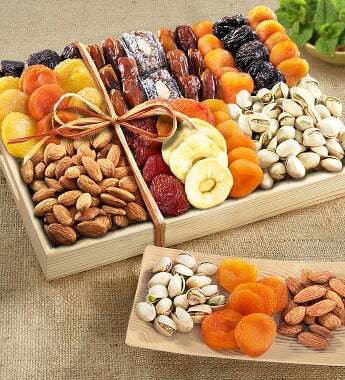 Nature's finest almonds and pistachios are paired with a premium grown selection of the finest dried fruits including apricots, pears, Angelino plums, peaches, and more. This gift is handsomely presented in a natural wood tray with raffia ribbon. A delicious and healthy gift that is sure to impress! Nature's finest almonds and pistachios are paired with a premium orchard grown selection of the finest dried fruits including apricots, pears, Angelino plums, peaches, and more. This gift is handsomely presented in a natural wood tray with raffia ribbon. A delicious and healthy gift that is sure to impress!